This painting entitled "Sakura" was done in response to the catastrophic disasters Japan suffered last month. It's done in watercolor & liquid acrylic mix on 140lb coldpress paper and I plan to enter it in the SDWC members show in May with the theme "Brothers at the Border", a cross cultural show. The tree depicted here, was blossoming in my backyard as the horrible events of Japan unfolded. 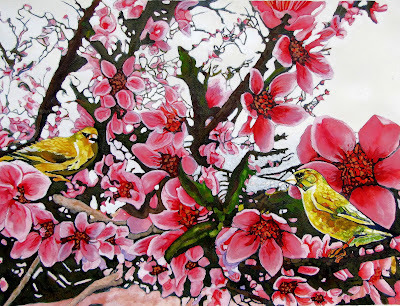 Cherry blossoms have always been a beautiful symbol for Japan and the two chirping finches represent countries, one perhaps the US and the other of Japan, sing and chirp in the lovely flowering spring season to convey hope and help in rebuilding all that had been lost. Wishing you all a happy Easter and spring time! Currently, my front and back yard is an explosion of flowers everywhere with freesias, tulips, paperwhites, wisteria, roses, blue irises and a blossoming nectarine tree! It smells like flowers especially when the ocean breeze comes in from the west at sundown. I feel like a huge bee with a camera going around from flower to flower snapping up photos for future paintings. Last year, I took photos of a lot of orchids growning in the Balboa Park Botanical Building on Mother's day. 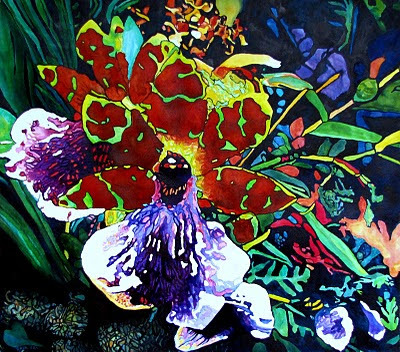 There was a very striking orchid with unusual petals and viewing it up close, it reminded me of Georgia O'Keefe's flower paintings. One of pictures I used as a reference for this painting. 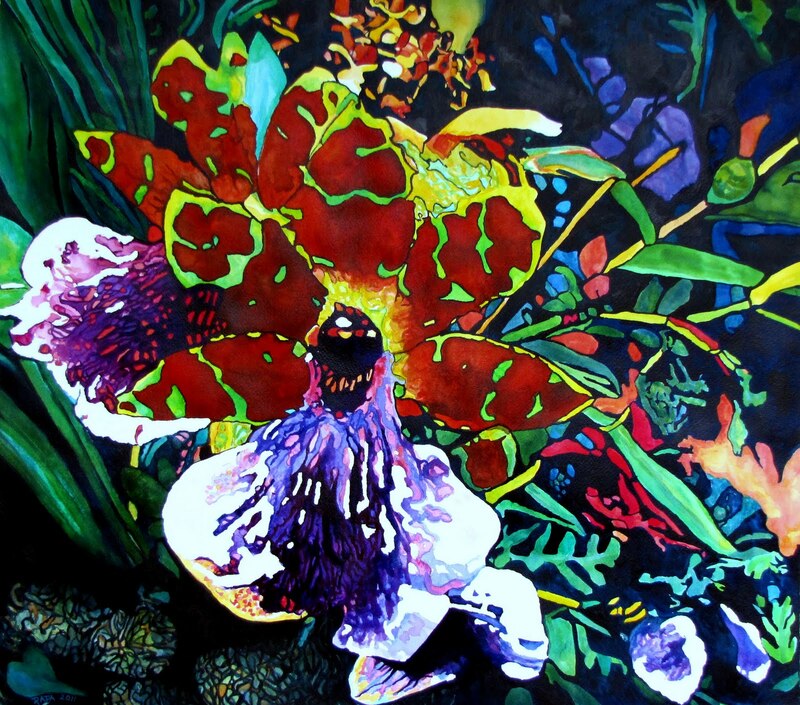 For now, it's just called "Orchid" but that may change if I can think of an appropriate name that's not too corny.